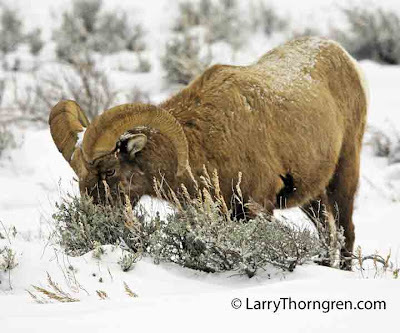 When the snow covers the grasses that Bighorns usually graze on, they turn to sagebrush for their nutritional needs. Sagebrush is used by many animals during the winter and allows them to survive in very harsh habitats. Humans have destroyed about 40% of the original sagebrush habitat by plowing and burning for agriculture and by covering it up with subdivisions and shopping centers. If we want wildlife such as Bighorns, Mule Deer, Pronghorns and Sage Grouse to survive, the remaining sagebrush covered areas must be preserved. Our local desert bighorn sheep population has been decimated by continued housing developments up in our local mountains. I was fortunate, however, to see two of them grazing by the side of the road last fall. They come down to the golf courses and chew on the hibiscus plants! Oh, LOVE your photo~I'm hoping to get one like that sometime!